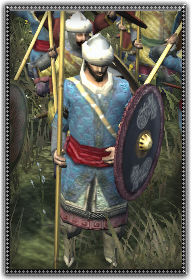 The Spear was a favorite weapon of the Arabs, especially for cavalry. Arab spears were usually made longer then the conventional spear seen in Europe and Africa, giving the rider more power and longer distance. Arabian cavalry was the foundation of many armies and Arabs pride themselves on their horses. Oman in particular is famed for some of the best Arabian horses, giving their cavalry an edge. Dismounted, these lancers make reliable infantry that can tackle ground work just as well as on horseback.